This patient fact sheet provides questions you may want to ask your doctor about the results of your diagnostic tests and explains the significance of the answers to the questions. Summer is when many people intentionally increase their sun exposure and their risk for skin cancer; therefore, this is a good time to review the facts. This installment includes information on radiation therapy and resources for patients undergoing radiotherapy. Information about colorectal cancer nurses can share with their patients, including a list of resources for patients and their families. The follow resources provide detailed information about treatment for recurrent ovarian cancer. There are many ways to prepare–and factors to consider–before deciding to enroll in a clinical trial. To improve communication between you and your health care provider, use this list of questions as a starting point for conversation. 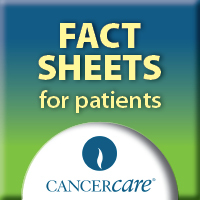 The following resource provides patients with helpful information on key factors to consider when selecting a treatment for cancer. September is national Ovarian Cancer Awareness Month in the US. Events will be held nationwide to spread awareness and hope.